We pay tribute today to Charlie Louvin, long-time Grand Old Opry member and elder statesman of Country music, who passed this week after complications from pancreatic cancer. 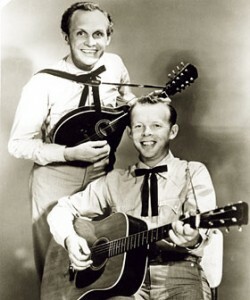 Charlie Louvin’s work with his elder brother Ira in the fifties found familiar placement on the Country charts – indeed, until the brothers split up two years before Ira’s death in ’65, the close harmonies of the brothers Louvin, with their mandolin-guitar accompaniment, were arguably among the most heavenly sounds on the radio. And though he was ever-dismissive about his own contribution to the songs for which he was listed as co-author, claiming that he was the music-watcher, who brought titles and concepts, new sounds and instrumental flourishes to his alcoholic, inward-turned brother to turn into songs, it is these self-same connections to the world of music at large which Charlie brought to the table that make his legacy so notable from the folk-watcher’s perspective. Originally trained in the country gospel tradition, Charlie and Ira started adding secular songcraft to their repertoire early in their career on the advice of a sponsor. In the end, though the broader base of inspiration surely helped bring them further recognition, their songbook remains dominated by hellfire and angels, the core question of how to live in balance between the demands of both the spiritual and secular worlds running throughout. And though his later solo work may have had less of an impact on the overall canon, it, too, continued the thread, marking Louvin as a keeper of the country tradition. Thanks to its heavy, heady influence on harmony duos from The Everly Brothers to Simon and Garfunkel, and on country rockers The Byrds, Gram Parsons, and Emmylou Harris, it is predominantly their early duet work for which The Louvin Brothers will be remembered – and sure enough, it is that work which we find covered most often, as seen below. But Charlie Louvin’s continued output in the half-century since deserves our recognition and respect as well. In the last ten years alone, like Johnny Cash before him, he enjoyed a renaissance of sorts, receiving two Grammy nominations – one in the traditional folk category, the other for best Southern, country or bluegrass gospel album – recording with Jeff Tweedy and Elvis Costello, opening for Cake and Cheap Trick, and headlining Bonnaroo. Check out today’s coverage, a set unsurprisingly dominated by bluegrass, country, and americana folk, and then turn your ears to both his older recordings and the final decade of his work for broken, heartfelt takes on a myriad of originals, classics, and traditional country gospel ballads. As always, Cover Lay Down exists first and foremost to connect artists and fans, for the betterment of all. If you like what you hear here, we encourage you to follow the links in each entry, to learn more and to purchase works from the artists we tout. But it’s also worth pointing out that because we believe that advertising would interfere with the pure relationship between you and the music, we depend on your donations to support the continued existence of this blog. All who donate will receive – within the next few weeks – a sampler of bootleg cover tracks recorded by yours truly at various concerts and festivals throughout 2010, and available nowhere else. And until the end of this month, 20% of all donations will be paid forward to the Food Bank of Western Massachusetts, the better to support the local community through the long winter. We’ve already raised over $100 for the cause. Won’t you consider helping out?